Today, I decided to display some Sibley Volcanic Preserve imagery. 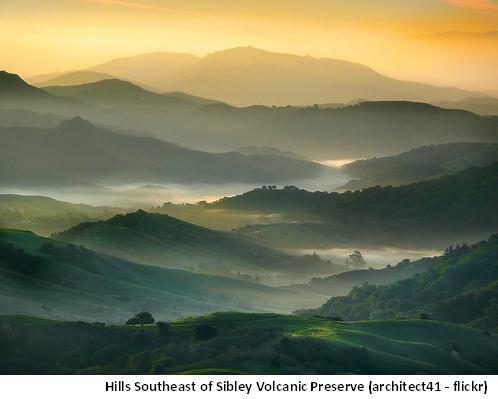 Sibley is sui generis in the East Bay Parks – and a convenient volcano right in our neighborhood. Normally I think of Sibley basking in its East Bay glory. I expect to see amber waves of grain, the volcano and its cool labyrinth, or else the typical views to San Francisco. We always take visitors to Sibley and hear the oohs and aahs about how lucky we are to live here. Sibley also inspires photographers to create art. These images are taken at special moments, such as the spring when the grass is green or on days with amazing sunrises. Have you ever seen Sibley looking so lovely?